Did you know that 25 major established retailers have lost over $64 billion in market share to smaller players? That’s because smaller companies were more flexible and took timely measures with digital transformation. A recent research by Deloitte shows that the Internet of Things is already changing the way consumers connect with and shop from the web. The shopping experience is soon going to be filled with all kinds of sensors: from digital ad screens to smart barcodes. Just look at all those mobile point-of-sale devices, smart mirrors, digital signage, and at-home shopping buttons – retail businesses are already making a shift to an omnichannel strategy of customer engagement.Yet, with the rise of Internet of Things (IoT), retail businesses are able to offer even more tailored experiences and incorporate digital elements into a shopping journey. Zebra 2017 Retail Vision Study predicts 90% of retailers to implement buy online, pickup in store by 2021. Meanwhile, 87% of retailers are predicted to deploy mobile point-of-sale (MPoS) devices by the same year. This will enable MPoS scan and allow accepting credit or debit payments anywhere in the store. 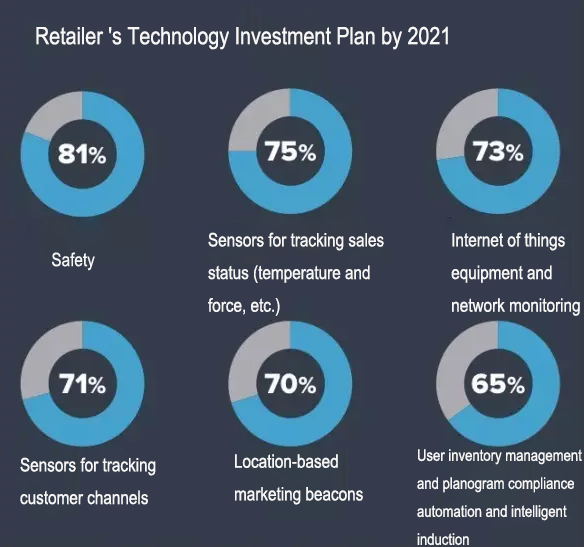 The study also finds that by 2021, 65% of respondents plan to invest in automation technologies for inventory and planogram management; nearly 79% will be able to customize the store visit for customers (as they will be able to collect information when a specific customer is in the store); and at least 75% of retail decision makers anticipate investing in predictive and software analytics for loss prevention and price optimization. At the meantime, the Grand View Research, Inc. claims that the retail Internet of Things software is expected to be the fastest-growing segment. The research shows that the global IoT in the retail market is expected to reach USD 94.44 billion by 2025. As can be seen in practice, with the help of IoT app development company you can build a bridge between the physical and digital worlds. This also gives retailers new engagement opportunities with the IoT service providers, so they can use brick and mortar stores as a part of a seamlessly integrated marketing strategy. The eMarketer study found that 80% of retail decision makers believe IoT is changing the way they do business, dramatically reshaping the retail shopping experience in the coming years. Internet of Things technology has provided retailers with better opportunities to customize in-store experiences. Thanks to sensors like Bluetooth beacons, customers behavior can now be tracked by following smartphones throughout the store. This helps better understand customers needs, improve stores layouts and offer a greater shopping journey. Nevertheless, physical stores are not the only ones to benefit from IoT adoption. B2B and B2C eCommerce stores do already benefit from physical objects that automate the purchase process. Amazon’s Dash Button – is one of the most outstanding and recent examples of physical devices that reduce the purchase of household staples to a single click. “Dash Buttons are available for tens of millions of products that ship with Prime. And Dash Buttons are free, so you can add as many as you want” – says Amazon. It is one of the numerous ways retailers use to connect physical and digital when touch is involved. Supply chain management and logistics are the retail areas where IoT is extremely important. It has always been essential for shipping companies to keep track of where everything is, and IoT apps make it much easier. Transportation and logistics industry companies may have different goals for IoT technology, so the scope of required solutions may vary a lot, just as the potential benefits and implementation methods from IoT app developers. In accordance with Juniper Research, the number of IoT-connected devices will gain 38.5 billion in 2020, up from 13.4 billion in 2015. The research finds that while IoT smart homes dominate the news, the public services sector (including retail) will soon form the majority of the device base. IoT integration benefits retailers and their customers in various ways. Cloud-based IoT solutions help companies study, control, and improve the existing processes. Customers are now able to interact with businesses in many ways. IoT technology made this interaction possible by providing physical stores with the same capability for data capture and personalization as online platforms. In the retail (sphere), IoT supports just-in-time inventory management systems that help businesses notify customers about special offers, order status, etc. Despite the fact that some of these systems allow stores to manually gather information, the Internet of Things integration automates the process, enables performance analysis of communications, and reports the success or failure of every transaction. Due to the strong collaboration with an IoT service provider, connected devices can leverage customer data and help retailers deliver higher-level interactions. Sounds like a sure success, doesn’t it? Stay tuned to get updates on the latest IoT use cases in retail!